There’s been some big and exciting changes at the Solargen Energy headquarters lately. We’ve now relocated to our brand new head office in Bamber Bridge. With two floors of office space, and a large storage unit on site, our new premises is perfect for meeting the demands of our clients – new and old! We’ve moved to Momentum Business Centre in Bamber Bridge, where a selection of new business units are recently finished and currently under construction. We’re now move central to our client base, with motorway links less than 5 minutes away. With our core office staff moved into the new office to support our teams out on site, we’ve been updating our website so we can engage more with our clients and customers. 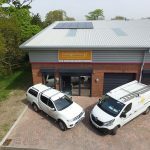 Keep up to date with the latest news right here on this page, or follow our Facebook and Twitter feeds to find out the latest about our solar and electrical contracting works.